Hex Thread Cutting and Tapping Screws – Ford Fasteners, Inc.
To produce hex bolts, manufacturers most commonly employ a method called cold-forming. A cold-forming machine usually has a series of three or four dies that progressively shape a metal blank into the final shape and dimensions that its manufacturer desires. Once the cold-forming operations are finished, a thread rolling machine cuts threads into the shaft of the unfinished hex bolt. From there, the hex bolt is most likely heat treated to obtain the sought after hardness and tensile strength. After this, the bolt, which is now finished, may undergo a final zinc plating or hot-dipping process in order to inhibit corrosion. 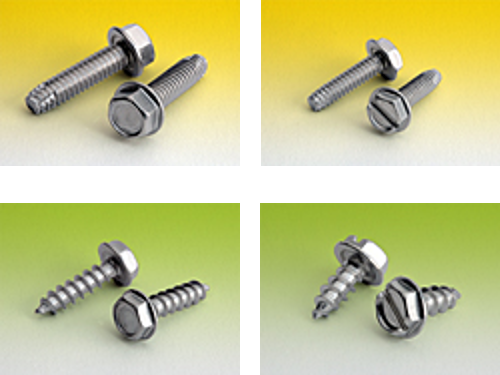 Stainless Steel Hex Screws – Ford Fasteners, Inc.
Hex bolts are categorized into one of several grades that are based on tensile strength and material composition. In the United States, the three most commonly used grades are two, five and eight. The higher the grade, the greater a bolt’s tensile strength and hardness. Bolts with higher grades are generally used in applications where stronger fasteners are required. Outside of the US, metric grades are used. To compare, for example, metric grades 8.8 and 10.9 are respectively equivalent to US grades five and eight. 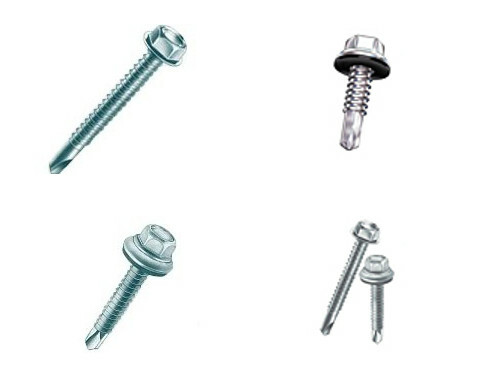 Stainless steel hex bolts are categorized by the type of steel used. The following are some of materials and grades by which hex bolts are categorized: stainless steel 18-8, stainless steel 316, zinc plated steel, zinc plated grade 5 steel, zinc plated grade 8 steel yellow, grade 8 steel plain finish, chrome plated grade 5 steel, hot dipped galvanized steel and silicon bronze. Additionally, aluminum and brass bolts are available for applications in the marine and aerospace industries. Stainless steel and silicon bronze hex bolts better resist corrosion than carbon steel and are typically used in applications where they will be exposed to the elements. Hex bolts are available in both standard and metric sizes and left and right threads. Additionally, both coarse and fine thread varieties are available. Hex Bolts Hex bolts, also called machine bolts, are cylindrical fasteners used to clamp two pieces of metal together. Hex bolts have hexagonal heads, thus the name, and machine threads for use with nuts or in a tapped hole.